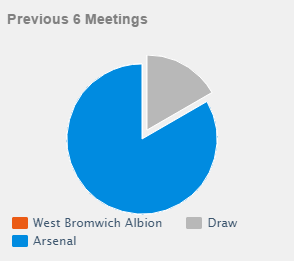 West Brom will host Arsenal today in an early Premier League clash at the The Hawthorns. Home side West Brom will be without Jonas Olsson and Silvestre Varela for today’s earlier clash due to injuries. Also Claudio Yacob is set to suffer his suspension. But Sébastien Pocognoli is expected to return but he is likely to start from the bench. Meanwhile for Arsenal, goalkeeper David Ospina is out with an injury but fellowman Wojciech Szczesny is expected to be back. Summer signing Danny Welbeck who suffered a minor knock against Manchester United last weekend is doubtful for this clash. Olivier Giroud is likely to take his front seat back. Mikel Arteta and Theo Walcott recently suffered injuries which has sidelined them for around two weeks. Full-back Mathieu Debuchy and German playmaker Mesut Ozil remains on the sideline. West Brom have not conceded less than two goals in six of their seven last seven Premier League home games. The Gunners are unbeaten in their last eight games against West Brom in all competitions. Saido Berahino has scored the most goals (3) from penalty spot this season in Premier League. Both goals scored by Olivier Giroud this season came in the stoppage time. West Brom 2 – 2 Arsenal, Alexis Sanchez on the score sheet for Arsenal.